Your child’s safety depends on EVERYONE following the rules. This school year with construction on campus, we ask you to keep calm during carpool. On the map below, you can see where students will and will not be able to be dropped off or picked up. Want to walk your student in the first day? 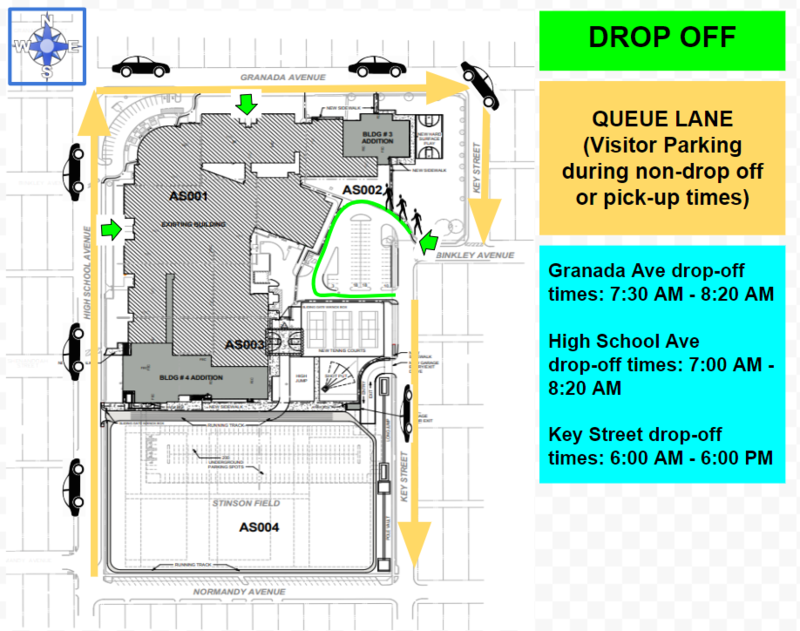 Arrive before 7:45 a.m. to find parking and get in the building. Want an even better alternative? Ride your bike to school with your student! There is ample bike parking on Granada by the 5th and 6th grade entry, or by the athletic field. Think there are more cars than you've ever seen in your life? The second day of school is better! Athletics begin for many older students, student carpools begin and help lower the number of cars around the school, and over 100 students walk or ride their bikes. Feel like you'll never get out of the gridlock? Wait four minutes, and every road will clear like magic. What is a queue lane? Good question! These are the traffic lanes that are directly next to the building on all sides of the campus. The middle lanes are for moving traffic only and are never used to load or unload. What are the rules of the carpool queue lanes? Pull as far forward as possible before stopping. Your student will be fine walking an extra 10 yards to get in the building--we promise! Queue lanes start at the intersections around the campus--don't cut the queue lane. The circle drive in front of the school is only for those that need special access to the building. You must have an access pass to enter the circle drive during carpool hours. Never drop your student in the moving middle lanes of traffic!